Well not quite, but almost. Today a second day of continuous rain here in my private training camp in Gréolières. 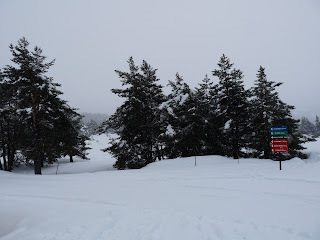 Last night the locals informed me that all the rain comes down as snow on the, higher, back side of the Cheiron and that the ski resort is open for business. I believe that being in shape is an important factor in (competitive) paragliding as flights can take 4-5 hours and although the physical effort is rarely huge it is not negligible. I did fly a couple of times with a heart rate monitor and for me the physical intensity of flying is about the same as for walking briskly. To keep in shape I go running on a daily basis, usually for 50-60 minutes. In addition I walk a lot, and every now and then do really long walks. The rain now prevented me from doing any of that and the Worlds are getting ever nearer. So lots of reasons for me to check out the local cross country skiing possibilities this afternoon. In short: excellent!